This is worked the same way as tivul stitch, but it is used in drawn thread work where more threads have been drawn put to edge both side of the resulting space. It is used on the lower edges of sleeves and poale. This is worked by taking 4 threads and sewing them in groups of 2. 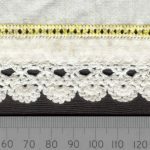 It is worked only in white thread, and is used for outlining motifs on men’s and women’s cămăși on the sleeve ends or on the poale. 5 or 6 horizontal threads are pulled out and the stitch is worked in white thread over 2 threads which are pulled together. It is used for outlining motifs on men’s cămăși and for household textiles. These motifs are found manly in Dobrogea. Tăietură is a self- contained motive worked on drawn or cut threads in a fixed pattern, which is the central motive among other motifs. It differs from Șabac in that the threads are not drawn out from the length of the cloth but are only cut out from inside the motive. The stitches comprising the outside of the motive are worked first, then the spaces are cut out in the centre, then drug or feston is worked over the remaining threads in the centre of the motive, finally the cut edges are trimmed leaving a motive shaped like a network. Tăietură is found in Banat, northern and western Transylvania, and Hunedoara.